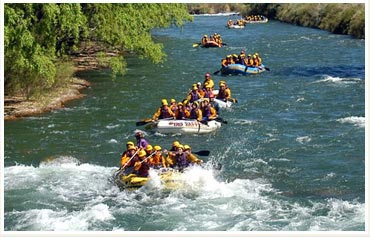 There are many whitewater rafting trips in virtually every state and province in North America. Many are not far from most major urban centers. There are also a number in Central America and south America, although we do not have much information about these as of yet. On some trips physical fitness is very important. Many others that are more family oriented. They can accommodate people who may not be as physically fit as others. Whitewater trips have become very popular for families, seniors as well as the extreme adventure tourist. Of course the more challenging the whitewater rapids are, the more equipment and skills you need to make sure that you will have a successful and safe trip. Regardless of which type of trip you take, always make sure you have an experienced guide with you. Also make sure that the equipment you are using is well maintained. Class one and two trips are for beginners, children and seniors. A class one set of whitewater rapids are relatively easy to navigate, although you still need to be wearing a life jacket and you need to follow the instructions of the guides. These can be very nice relaxing whitewater trips were you can enjoy the scenery. And also the wildlife that may exist along the river.Most of these trips do not require any level of physical fitness or swimming ability since there is little likely hood of you ending up in the water. However always were a life jacket since someone can make a wrong move and end up in the water. After all you are on a raft in the water and common sense demands that you wear a life jacket. Even if you can swim always wear a life jacket while in the raft. If you are planning to take on higher class rapids, make sure you read the requirements and the safety issues before you sign up. This will make sure you receive what you expect in terms of whitewater thrills. Verify the condition of the equipment and the experience level of the guides. After all if something goes wrong you want to know that you are in good hands. Class 3, class 4 and class 5 rapids are progressively more difficult and thrilling. You may need to pass a number of tests before going on some of these whitewater trips. Guides need to make sure that you can handle any of the potential upsets that could occur.Although in Class 3 and 4 rapids you probably will not flip out of the raft, you should be able to swim. You need to know how to swim out of a rapid as well as some of the circular spins that are set up around some rocks. This demands a certain level of common sense, experience and physical fitness to be able to do this. Particularly in class 5 whitewater rapids trips, participants could be thrown out of the raft or the raft could even tip over. If this happens you need to be able to swim out of the rapids and get to shore were someone can pick you up. Being tossed about in the water in the middle of a set of rapids is not for the faint of heart, nor the non swimmer even if you have a life jacket. Make sure you have your helmet on and focus on what you need to do. The worst thing you can do is panic. Focus on staying calm, recall the guidelines your guide gave you about swimming out and avoiding rocks. If you are not up to the task of swimming out of the whitewater rapids, then this level of rafting trip may not be for you. You can still have great thrills if you go on lower class rafting trips down whitewater rapids. Remember too that rapids classification are also dependent on the amount of water that is cascading down the river. Spring runoff will usually bring higher cascades than summer or late fall unless there are heavy rains in the headlands of these whitewater rapids. If you cannot go on a particular rapid in the spring or early summer due to the amount of water churning down the river, check back in the late summer. There may be less water at that time and you will be able to enjoy the scenery and thrill on that particular set of rapids at that time. As you gain experience, perhaps train and get into shape, learn to swim or improve your swimming, you will be able to take on even greater rafting challenges. It is all about having fun, having a few thrills and being safe in an environment that is potentially quite dangerous. You constructive comments are welcome. i just want to have fun and not be scared to death or not have enough strength to go white water rafting down some rolling river. before i go white water rafting, i am going to really check out the staff and the river.